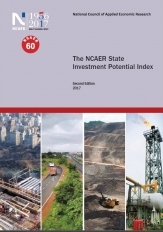 The NCAER State Investment Potential Index 2017 (N-SIPI 2017) is the second edition in the annual series of rankings of states on their growth and investment potential. It is a systematic and evidence-based index that assesses the competitiveness of states on 50 parameters grouped under six broad pillars: land, labour, infrastructure, economic climate, governance and political stability, and business perceptions. N-SIPI 2017 builds on the framework and methodology of N-SIPI 2016, and uniquely incorporates the results of an extensive survey carried out in April and May 2017 across 20 states and the Union Territory of Delhi.